With renowned herbalist Rosemary Gladstar as your guide, it's easy to make your own natural teas, salves, tablets, and food to help children fight common ailments, from colic and teething to nappy rash, cradle cap, colds, coughs, sore throats, cuts, burns, conjunctivitis, and much more. 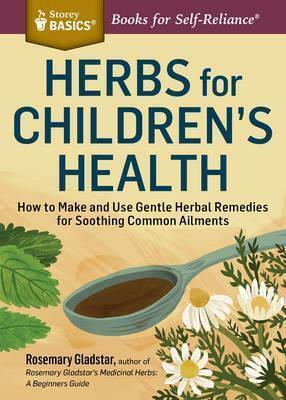 Rosemary introduces you to 24 of the best herbs to support children's health and provides simple instructions for preparing and using them, with specific dosage guidelines for kids ages 3 months to 12 years. When it comes to soothing a sick or hurt child, only the gentlest, time-tested remedies will do. Best-selling author and respected herbalist Rosemary Gladstar is the perfect guide. Her recipes -- safe, effective, and without side effects -- can be used for all the most common ailments that affect children: teething, colic, cradle cap, diaper rash, earaches, fevers, colds, burns, cuts, and more. They also take many forms that will appeal to children, from herbal popsicles and "candy" balls to teas, syrups, and calming baths.